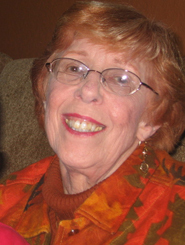 Marilyn Keller has been a long-time part of the Chicago-area PFLAG movement. She and husband Jerry, parents of two gay children, founded PFLAG Glenview. She says: "In the mid ‘80s, my son Irwin was an activist in the gay community and was visible in the press and on TV. I had to come out and now, in 2008, I still come out to new people I meet. The best part of coming out is educating the people you tell. I have been fortunate that no one has given me a negative response."